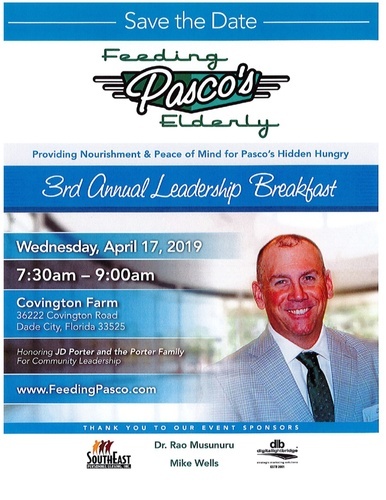 The Pasco County Senior Services Division is pleased to announce Feeding Pasco’s Elderly will host its 3rd Annual Leadership Breakfast at Covington Farm in Dade City. This year’s event will honor JD Porter and the Porter family for their community leadership. One in six seniors in Pasco County is hungry or food insecure. Please join us for the 3rd Annual Leadership Breakfast to help raise money that will provide desperately-needed meal service to those who are unable to help themselves. With your support, we can ensure no senior goes hungry. For more information, and to make a reservation, please visit: feedingpasco.com. A printable event flyer for the Leadership Breakfast is available here: bit.ly/feedpasco.